Can you guess what I've been up to this week? Maybe if you strike a ponderous pose like this one it will help. 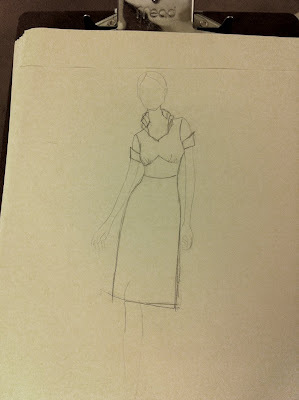 I've been working on a dress design for Shabby Apple Dresses and their "Dare to Design Competition," and here it is. I should have hemmed it up a little more for my short figure, but I was running out of time. As you can tell I'm getting this in just before the wire. It's hard to tell the little details from the full shot. I just adore that plum, lavender, grass green, and cerulean. Oh and white, I love white. I wish I could have found a white with purple pinstripes. That might have been adorable, or a disaster to match up. Good thing, I went solid this close to the finish line. Like Sewweekly, I get a lot of my inspiration from vintage clothing. This one has a bit of wiggle dress-ness. I am also inspired by film, particularly period pieces. For this dress, I kept thinking of Jane Campion's Bright Star and the line, "This is the first frock in all of Woolwich and Hampstead to have a triple pleated mushroom collar." I didn't quite make it to triple. I know, I know, all I needed to enter was a sketch, but I feel much more confident sewing than drawing. Plus, presentation is critical in this contest. Sorry little sketch, you're not so presentable. Come back when you've cleaned yourself up a bit. The best of luck with your entry. I would totally buy that dress! i know i say this on every post...but you are amazing! i would totally wear that dress. What are you talking about? Your sketch alone would have sold me on the dress! It's a perfectly lovely sketch. But holy cow! The dress is GORGEOUS in real life. OK, so I've gushed about your crazy mad sewing skills before. But hello! Where did you learn to sketch like that? Truly amazing. Your dress looks fantastic, I love the sleeves! I love your sketch and the actual design... especially those pleats. Ohmygoodness! This dress is perfection; from the pleated collar to the bustline and arm cuff detail. I love it! I hope you win!